Quilting was a popular form of decoration for a variety of garments including pockets. However, hand-quilting was a time-consuming method of decoration. The increased demand for quilted petticoats, waistcoats and pockets led to the invention of woven quilting. In this technique, an extra weft of thick thread was added to the fabric to give the raised effect of the handmade version. Robert Elsden is credited as the inventor of woven quilting, known by the French term, matelassé. He received a prize from the Society for the Encouragement of Arts, Manufactures and Commerce, in 1745, although the perfection and commercial exploitation of this technique of machine quilting appears to have taken place in the 1760s. 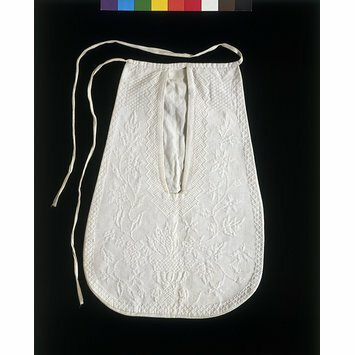 This is an example of matelassé linen, which has been clearly woven into a pocket shape and could not be sewn into any other object. It may represent a ‘ready-made’ pocket, one sewn up and sold as a finished accessory, rather than made at home. 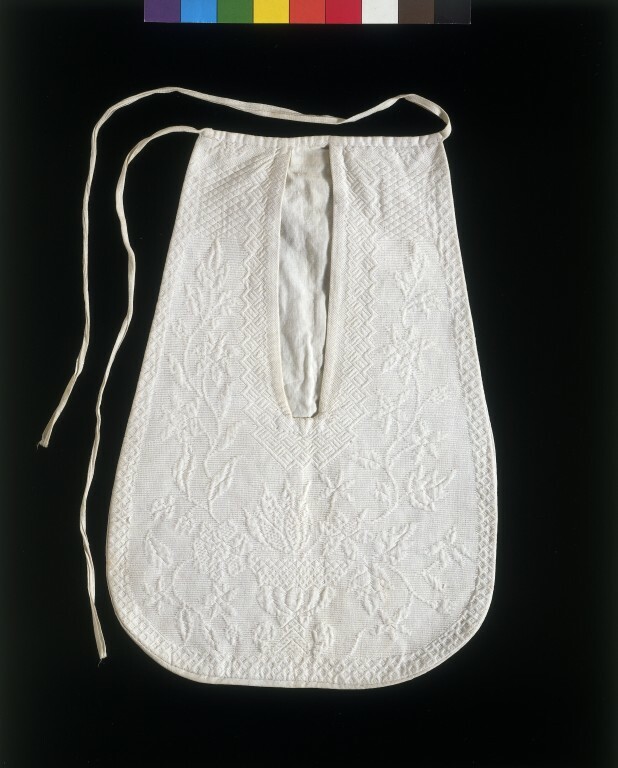 Pocket, with front made of woven, quilted linen or matelassé with a suggested pattern of a flower pot with flowering tendrils growing up each side of the pocket slit. Around the border is a honeycomb pattern and around the pocket slit, a zig-zag pattern of diamonds filled with bars in alternating directions. The pocket is of conventional lobed shape, has a cotton twill back and is suspended from a linen tape binding the top and having two ends to tie. Historical significance: This is an interesting example of woven quilting or matelassé. Also of note is the fact that it is woven to shape, which might suggest a ready-made pocket.